San Diego Gas & Electric is opening a ratepayer-funded showpiece for energy efficiency that expands the utility’s role as an adviser on power consumption and savings for homes and businesses. SDG&E’s sleek Energy Innovation Center stands beside a thrift store, barber shop and ethnic restaurants at a roadside mall in Clairemont. At a community open house on Wednesday, the utility company will offer a first glimpse inside its 27,000-square-foot complex of conference rooms, kitchens and kiosks. “We’re really hoping to use the center to interact with the customer and show how they can save money,” said Ted Reguly, director of customer programs and assistance for SDG&E. Inside the $7.5 million facility, the public can take a close-up look at the latest options for lighting, heating, ventilation and air conditioning. There’s an emphasis on conveniences and automation that can help reduce utility bills. Much of the green technology on display is integrated into the building, from carpetlike flooring made from tires to a broad ceiling fan with blades like an airliner’s wings. The center’s own energy consumption—and solar energy production—can be viewed over time on touch-screen displays inside the building’s entrance. SDG&E is the last of the state’s large investor-owned utilities to open its own energy education center. Until now, the California Center for Sustainable Energy, a third party to customers and the utility, has produced and played host to energy efficiency programs paid for by ratepayers at its own facility about four miles away—the San Diego Energy Resource Center. By year’s end, SDG&E will take charge of that programming and an annual budget of more than $1 million. Where other states rely on third parties to help the public conserve energy, California has firmly thrust utilities into the role of raising the public’s awareness and effectiveness at saving energy. Consumer advocates question whether California’s utilities, which derive profits from infrastructure, are the right ones to spearhead the movement. The effectiveness of SDG&E’s Energy Innovation Center will be under scrutiny as it opens. “It’s unclear to me—given the cost of the building—the value in terms of raising consciousness about energy efficiency in the community,” said Nicole Capretz, associate director for the Environmental Health Coalition in National City. SDG&E will recover its construction costs from ratepayers across San Diego and southern Orange counties—along with a profit based on a standard rate of return approved by state regulators. That return rate was most recently set at 8.4 percent for SDG&E’s required revenues. The center is likely to boost the image of SDG&E as an environmentally conscious utility, but customers might benefit more from direct energy efficiency rebates and assistance, said Mindy Spatt, a spokeswoman for the Utility Reform Network. Reguly of SDG&E said the energy center will track attendance and survey customers about what they find most valuable, but acknowledged there are inherent limits to gauging actual energy savings. The timing is right, however, to help customers better control their consumption and spending as SDG&E provides more real-time feedback from smart meters already installed across SDG&E territory, said Reguly, who previously oversaw deployment of the data-producing meters. Seminars and events will be available by webcast. Partnerships are in the works with local youth groups. And a staff of 10 already is striving to keep the Energy Innovation Center relevant and vital. “This building should be constantly evolving and changing,” said Brandi Turner, community engagement manager. The visitor’s experience at San Diego Gas & Electric’s Energy Innovation Center in Clairemont starts in the parking lot, where sun-tracking solar arrays shade the pavement by day and light-emitting diodes (LED) illuminate the night. Inside, many of the center’s so-called light switches trigger high-tech skylights that reflect or concentrate outdoor light into conference rooms and hallways. At the food-service demonstration kitchen, business owners can try out more than 40 energy-efficient appliances to see if they can reduce power use while still replicating their recipes. On a back patio, solar-powered irrigation feeds an urban garden, where strawberry plants sprouting from pouches draped from a fence. An interior-exterior collage of wood panels—redwood, ipe, and red and yellow cedar—has a renewable provenance certified by the Forest Stewardship Council. The building isn’t entirely new. 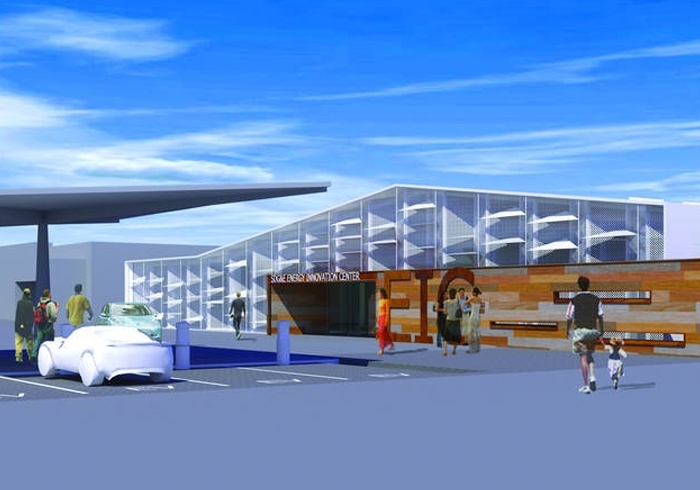 A retrofit by Ocean Beach-based architects hanna gabriel wells preserved some of the original lines of a 1959 DeFalco’s grocery that later became a Ross Dress For Less and a food emporium. SDG&E is seeking certification of “platinum” status from the U.S. Green Building Council under its LEED program—short for Leadership in Energy and Environmental Design. The status is awarded to buildings on a points system based on water and energy efficiency, waste management, sustainable purchasing, temperature monitoring, commuting programs, environmentally friendly cleaning and other criteria. The building may also be recognized as a net producer of energy. As SDG&E expands programing at its Energy Innovation Center, the California Center for Sustainable Energy will continue during 2012 to provide energy efficiency and green building workshops at its Energy Resource Center (8690 Balboa Ave.) as well as SDG&E’s facility. A schedule can be viewed at utsd.us/ccsesched. CCSE does not plan significant changes to its workshops on workforce training related to home performance, solar electricity, solar hot water heating and transportation. In 2012, CCSE plans to expand outreach efforts, including its truck-mounted Residential Home Performance Roadshow, a Green Learning Adventure program for middle- and high-school students and education through community colleges. SDG&E’s calendar of seminars can be found online at sdge.com/seminars-and-events, along with a registration form for independent seminars or business meetings that contribute to the center’s mission.